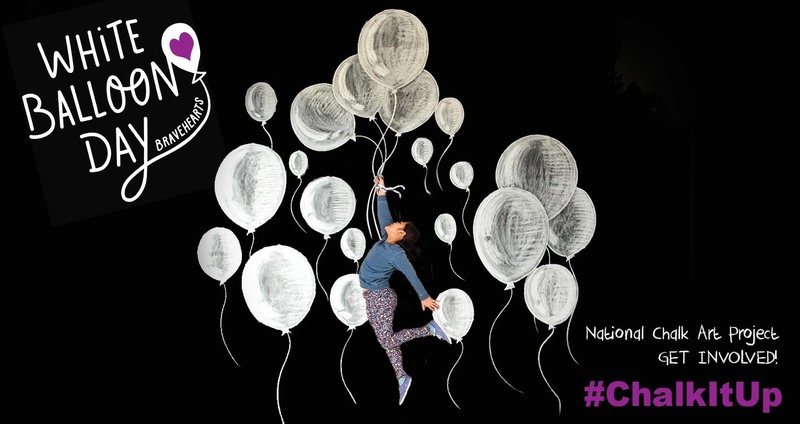 Bravehearts’ annual White Balloon Day will celebrate 21 years on September 8 with registrations pouring in from all over the country to help protect Aussie kids from sexual assault. Founder and Executive Chair of Bravehearts Hetty Johnston AM, is calling on individuals, schools, organisations and businesses to chalk it up for Bravehearts’ signature awareness campaign by registering today at www.whiteballoonday.com.au. “White Balloon Day is very close to the heart of communities right around the country and is the longest-running child protection campaign dedicated to the prevention of child sexual assault,” says Mrs Johnston. “Bravehearts has come so far over the last two decades and has been instrumental in breaking the silence on this crime, but we have a long way to go, and on September 8 our quest continues as we strive to create a safer Australia for our children. This year’s campaign will feature innovative and fun activities for all ages including the Bravehearts National Chalk Art Project and a virtual balloon race. The Chalk Art Project will see schools and budding artists of all ages ‘ChalkItUp’ for Aussie kids by creating a chalk mural or drawing of their own design and sharing images of their work on social media using the hashtag #ChalkItUp. Each piece of art must include a white balloon as a symbol of hope, with the most creative pieces receiving prizes for their efforts. “Child sexual assault is a tough topic but we are encouraging the community to ‘chalk’ about it through art and sharing the message of hope and prevention,” said Mrs Johnston. White Balloon Day is held annually during Child Protection Week (Sep 3-9), White Balloon Day is Bravehearts’ key awareness and fundraising event designed to help prevent a crime which affects more than 60,000 children every year. Since its inception, Bravehearts’ education program ‘Ditto’s Keep Safe Adventure Show’ has educated more than 720,000 children about personal safety. Cyber safety initiative ‘CyberEcho’, which has been developed in partnership with Google Australia and the Australian Federal Police, is aligned with the Australian National Curriculum and is the leading education program in Australia for teaching students and teachers how to stay safe online. Money raised throughout the White Balloon Day campaign goes towards these education initiatives as well as Bravehearts’ suite of training programs and specialist support for kids and their families who have been affected by the crime of child sexual assault. Bravehearts’ Vision is to make Australia the safest place in the world to raise a child. It aims to achieve this with its child protection blueprint – 3 Piers to Prevention – Educate, Empower, Protect. More information is available HERE. Further information about White Balloon Day and how you can get involved in this year’s campaign is available via the official White Balloon Day website at WhiteBalloonDay.com.au.